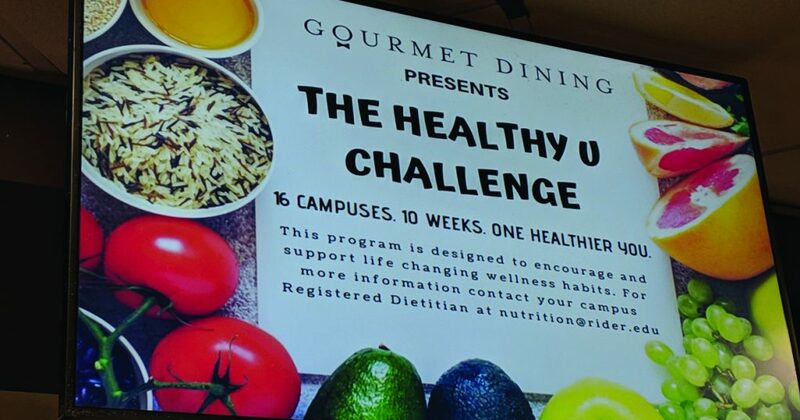 The “Biggest Loser Challenge” was recently renamed “The Healthy U Challenge,” following the release of a Letter to the Editor, featured in the Feb. 20 edition of The Rider News. The rebranding came shortly after the release of a Letter to the Editor to The Rider News called “The Real Biggest Loser,” which addressed the negative effects the challenge’s logo and name had on students with eating and mental health disorders at Rider. The new marketing campaign, which used colorful fruits and vegetables as well as positive words and phrases, was tailored to encourage contestants and students to eat and feel better, inside and out. The encouragement found on the advertising for “The Healthy U Challenge” reflects the effective and safe weight-loss program that participants have taken part in. The 10-week program, which is registered-dietitian approved, began on Feb. 18, and encouraged participants to be safe and healthy. Each participant signed a contract which helps them understand their preparedness and confidence before starting the challenge. The detailed packet of information that was given to students and staff at the beginning of the challenge included a variety of nutrition information for participants, meal ideas that are filling and fun and plenty of safe and simple workout styles that get participants up and moving. The program, which reached the halfway point on March 25, also had optional prizes for participants who lose the most weight. Essenfeld mentioned that participants were happy to receive a free jump rope just for showing up to the event to mark the halfway point. The challenge is having a great impact on the students involved in the challenge, as well as students outside of the event. Freshman public relations major Hailey Hensley said that it was admirable of Gourmet Dining to respond the criticism it was given for the original name of the challenge. “It is really cool of Gourmet Dining to adapt for the sake of the physical and mental well-being of the student body,” she said. Essenfeld, who witnesses the participants’ positive physical and mental transformation, values the transformation that she sees. As “The Healthy U Challenge” finale approaches, Essenfeld looked back on the program happily, knowing the positive impact it has made on the lives of students and staff at Rider.